The purpose of this site is to allow you to choose the garage that best meets your needs. Research shows that when making a decision about any service provider a recommendation is the single biggest influencing factor. This guide lets you hear the opinion of other users so that you can then choose a garage with the comfort of knowing what others think of them. The garages in this scheme have agreed to a 'Good Service Charter'. This means that they will not only service your car to at least the standard that is required by the manufacturer of the vehicle, but they will also adhere to the ‘Customer Service Element’ of the charter. Insert the post code of the area you are in, or where you want the service to be carried out. Coming soon - The system can book your service and/or MOT online. Once you have had your service we hope that you will help maintain the accuracy and relevance of the site by giving feedback on the service that you have had. This is done by either coming back to this site and clicking on the relevant garage and again clicking on ‘Give Feedback’, or using the prepaid postcards given to you by the garage when you pick up your car after the service. 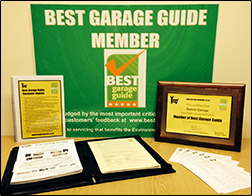 We, and the garages involved in this scheme, are dedicated to driving up standards in the car service industry.